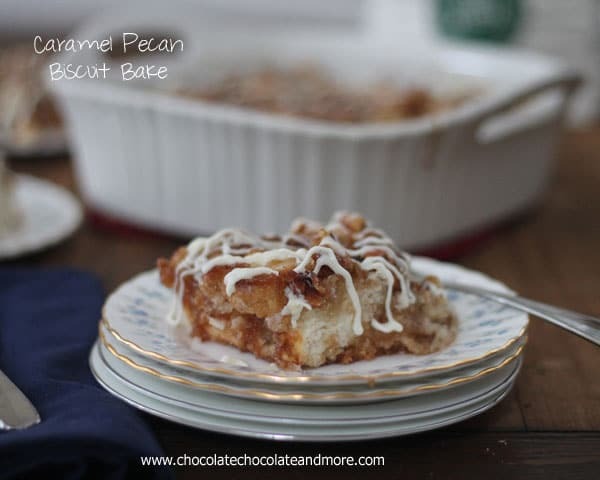 Caramel Pecan Biscuit Bake - Chocolate Chocolate and More! 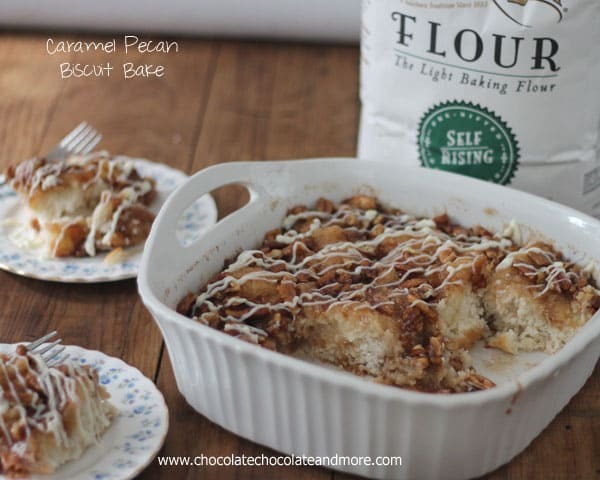 Caramel Pecan Biscuit Bake-Just a few minutes to prepare, a biscuit base topped with a caramel pecan topping and a cream cheese icing! Did you know that September is National Biscuit Month? Neither did I. But that’s probably because in my house, every month, week, day, could be considered a biscuit holiday. Seriously. 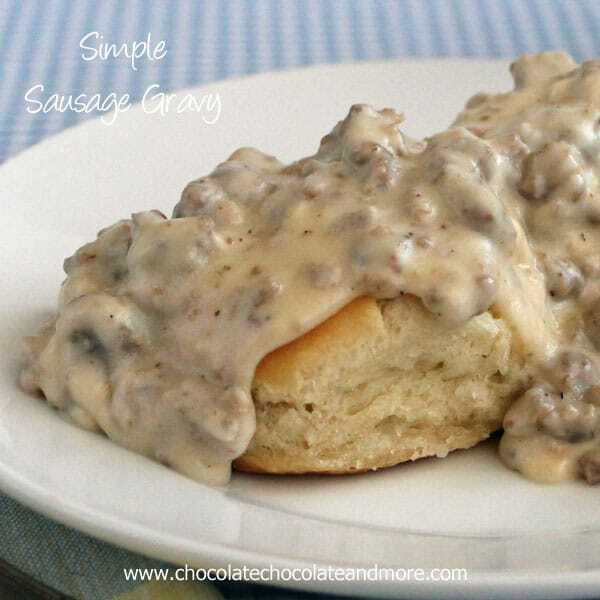 Biscuits aren’t just breakfast food. I can make up a big batch of biscuits for a meal then the next day find a kid (or 3) having one as an after school snack with some jelly. Or making a biscuit sandwich with some ham and cheese. I serve biscuits with anything and everything. When you want a bread with your meal, biscuits take just a few minutes to throw together and they are always good. As part of White Lily’s #SavetheBiscuit campaign, I knew I’d have no trouble coming up with something sweet. I was thinking along the lines of a coffee cake, or a cinnamon sugar topped biscuit, or scones. (All of these will be happening soon. I promise I’ll share the recipes as soon as I make them.) 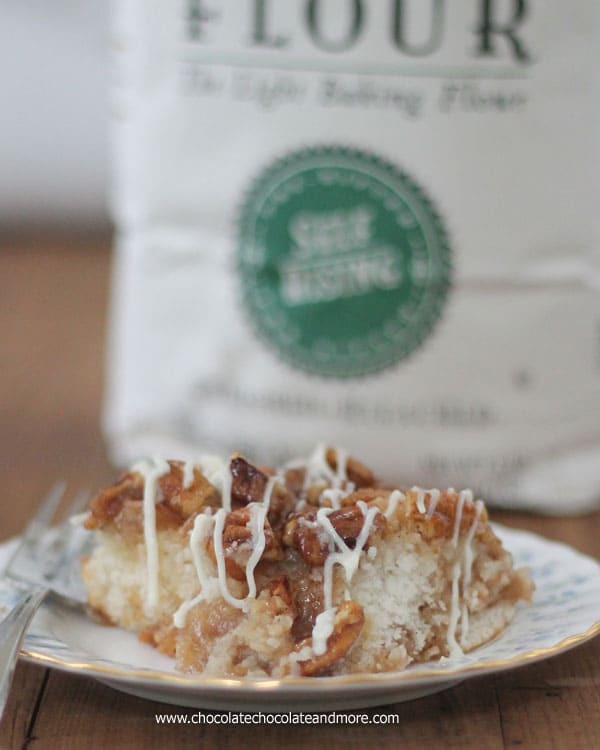 Looking for the perfect inspiration, I came across this recipe for a Caramel Pecan Biscuit Bake from White Lily. It only took 5 minutes to put together, then 17 minutes baking. The hardest part was the waiting. For it to cool off a bit before eating. Every bite was sweet and caramelly, with the lightness of the perfect biscuit as the base. 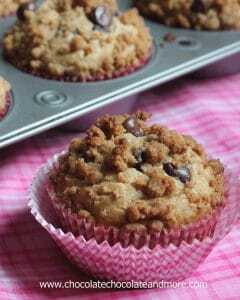 I can tell you, this is our new go to, want something sweet for breakfast treat. Using a pastry blender, cut shortening into flour. Stir in buttermilk, just until all dry ingredients are incorporated into dough. Gently press dough into a lightly greased 8x8 inch baking dish. Stir topping and then pour topping over top of dough. 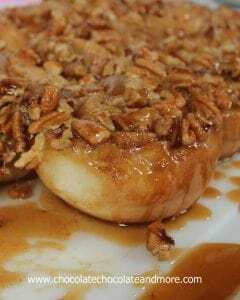 Bake in a preheated 400 degree oven for 15-18 minutes, until dough rises and topping has caramelized. Remove form oven and let cool for 10 minutes. Prepare icing. place cream cheese in a microwave safe dish and heat for 20-30 seconds on high. Remove from microwave and stir in powdered sugar and vanilla until no lumps remain. Drizzle icing over cake just before serving. To create a thin drizzle with the icing, place icing in a small plastic bag, pushing icing into one corner. Cut a small edge off the corner of the bag, then gently squeeze icing from bag, through the hole, over cake to drizzle. I’m an ambassador for White Lily Flour and was compensated for this post. All opinions are my own. I wouldn’t share this with you if I didn’t really love it. 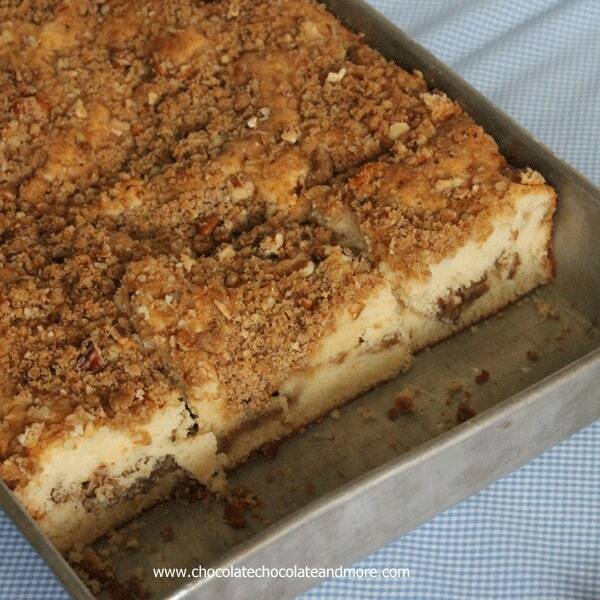 I have ever made a biscuit bake, But with caramel and pecans, it’s sounding like that will be changing mighty soon! Sounds amazing Joan! Pinned! The caramel started calling me, but then I noticed the cream cheese icing… GAH! Must. eat. now! You are so right and White Lily is the best! Holy yum!!! I just can’t imagine a better biscuit! 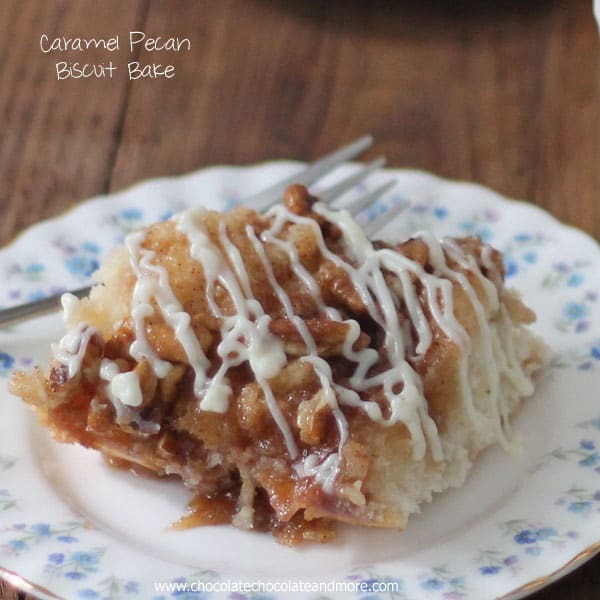 Caramel and pecan are two of my favorite words 🙂 This bake looks ridiculously yummy Joan! Thanks, it is a delicious breakfast treat! I NEED BISCUITS-it’s been way too long and I love them oh so much! 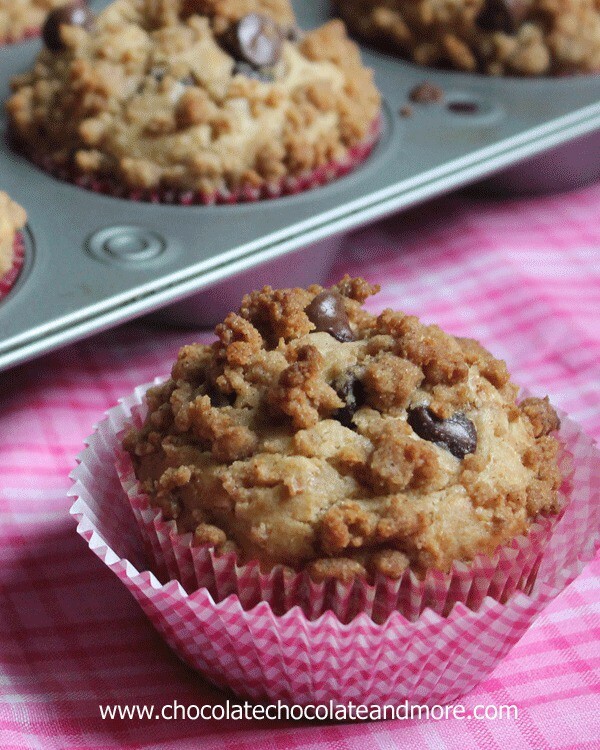 This recipe is so creative-like a gooey, nutty, yum yum yummy piece of happiness! 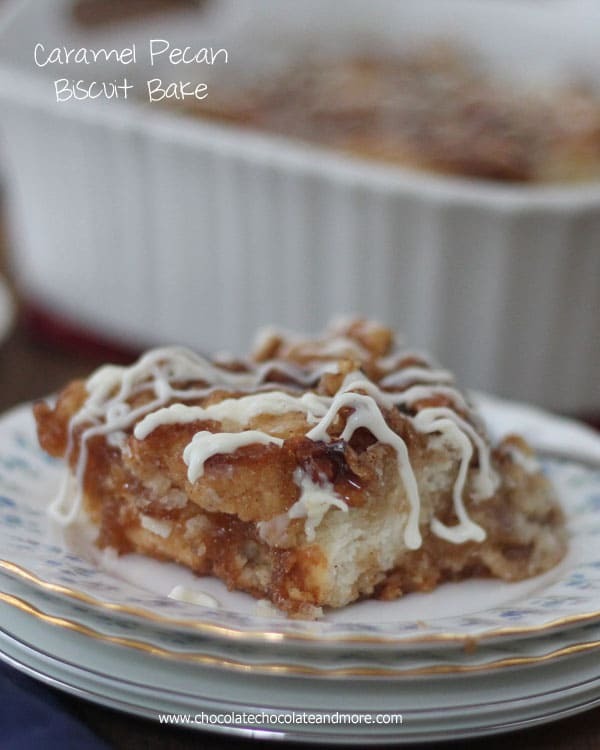 Thanks Kayle-we fell in love with this biscuit bake and so easy to make! I’m a huge sucker for anything caramel and pecan, this looks amazing Joan! The ONLY flour I will use for biscuits!! Thanks for sharing at our Best Of The Weekend party, Joan. This looks amazing!